Chopped is everything that is right about TV nowadays. It’s a show that has all the right elements: a witty host, high stakes, cutthroat competition and (most importantly) food. One day, I hope to win it (my best shot is probably the amateur series). As much as this show teaches me about cooking, it also has given some insights into the world of communications and public relations. Let’s welcome our chefs (que intro montage). Professionals have a wide variety of backgrounds and experiences; some people have fives years of agency work under their belts, some have only a start-up catering company. The one thing we do have in common is everyone has a story. They probably won’t let you compete on Chopped unless you’ve experienced some heartbreak in life. Some are a tad more legitimate than others, and it is important that we have the ability to sift through these stories and deem what is newsworthy. Chances are, I’ll be more inclined to root for you if you beat cancer and you want to give the $10,000 prize to charity than if you want to take your family to Disney World for the seventh time. The same concept applies to pitching; your story is more likely to get picked up if it hits close to home and people can invest themselves in it. Chefs, open your baskets. There’s always a mystery basket. Sometimes there might be a curve ball, or an entire octopus, lurking in the client’s agenda. “I want this video to go viral.” Gah. Like beef tongue in the appetizer round. Sometimes, especially with start-ups, clients don’t always realize what is a realistic PR expectation. Morphing the client’s hard-to-deal-with ideas into a manageable, easily digestible pitch can be a challenge worse than a malfunctioning food processor. However, going into the round with ideas of how to attack the basket, and an idea of how to manage the client’s needs and expectations, can get you to the entrée round. Meet our (ever-changing panel) of judges. It might be Alex Guarnaschelli here to tell you she thinks your veal is undercooked, or it might be Mr. “Sit-on-my-phone-during-the-entire-pitch” sitting across the table tasting your media relations strategy. It is important to not only research your clients needs, but also to whom you’re specifically presenting. Geoffrey Zakarian may love your gummy bear gastrique, but your client may not love your plating (and presentation is worth more than 15 points in the PR world). Make the pitch personal, because that addition of flavor could help you move on to the dessert round. Chefs, you have 30 seconds left on the clock. No surprise here, PR pros are on a deadline too. If you can’t get the ideas organized and on the plate before the deadline, then you will be chopped. Although typically we do have more than a half hour to plan, some, such as SEO strategies, can take three to six months to see results. Regardless, if the project is due in a few weeks, or if your boss pops by and makes a “have it to me by the end of the day” request, it is crucial to step away from the plate and press send when time runs out. Yes it is true, more often than not I like to come home and watched Chopped at the end of the day. It’s also true that there are more takeaways than just what pairs well with finger limes. If you can’t take the heat, get out of the kitchen. 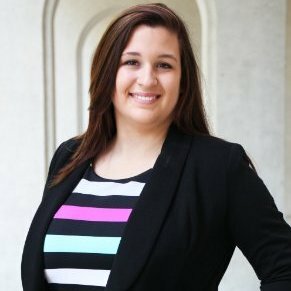 Devon is a senior majoring in strategic communication and minoring in marketing. She will be graduating this December, and hopes to move to Charlotte where she can eat some good BBQ and work in corporate PR. Give her a follow on Twitter at @LuckyNumbrDevon!